Richard Wagner (22 May 1813, in Leipzig - 13 February 1883, in Venice), a German composer, was one of the most influential people who lived during the 19th Century. His most influential works were in the medium of opera. These compositions include Der Ring des Nibelungen, Tristan und Isolde, and Die Meistersinger von Nürnberg. 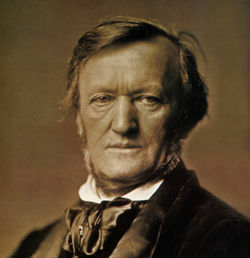 Even though he died more than a century ago, Wagner remains a divisive figure due to his personal views. Wagner first attended school in Dresden and eventually attended Leipzig University in 1831. At this time he studied briefly with Christian Gottlieb Müller and was heavily influenced by Beethoven. He gained his first position through help of his brother as the choirmaster at the theater in Würzburg. Wagner composed operas at this time influenced by Weber and Bellini. His early career led him to travel throughout Germany with one company, hold a position in Berlin, and move to Paris in 1839. His first large success was with the premiere of Rienzi in Dresden on 20 October 1842. This was followed shortly by the premiere of Der fliegende Holländer, and then Wagner's appointment as assistant choirmaster for the court in Dresden. While in this position he presented the premiere of Tannhäuser. In 1848, after the revolutions in Paris and Vienna, Wagner saw an opportunity to develop a German national theater and joined revolutionary minded people. When an attempt at revolution in Dresden failed, the composer was forced to flee because of his associations with the revolutionaries. He first stayed at the home of Liszt but then moved on to Zürich. Wagner spent much time writing in the 1850s and was able to secure living expenses from two women. Ideologically, he began to associate with the philosopher Arthur Schopenhauer. He conducted important works such as Tristan und Isolde and Die Meistersinger von Nürnberg but Wagner had also accumulated a lot of debt. In 1864, Ludwig II of Bavaria gave the composer money to pay his debt and also gave him an annual salary as well. This helped Wagner to move back to Germany and to develop his theater in Bayreuth. The composer also developed a relationship with Cosima, the daughter of Liszt and wife of Hans von Bülow, who he eventually married. In 1876 the complete Ring Cycle was performed for the first time. Wagner's last major, Parisfal, was premiered in Munich in 1882. He passed away from a heart attack shortly after moving with his family to Venice. Miles, Richard B., and Larry Blocher. (2010). Teaching Music through Performance in Band. Volume 1. Chicago: GIA Publications. pp. 754. Slominsky, N. (1988). The concise Baker's biographical dictionary of musicians. Schirmer Books: New York, NY. Tan, Leonard. "Huldigungsmarsch." In Teaching Music through Performance in Band. Volume 9, edit. & comp. by Richard Miles, 549-557. Chicago: GIA Publications, 2013. This page was last edited on 4 September 2017, at 08:31.